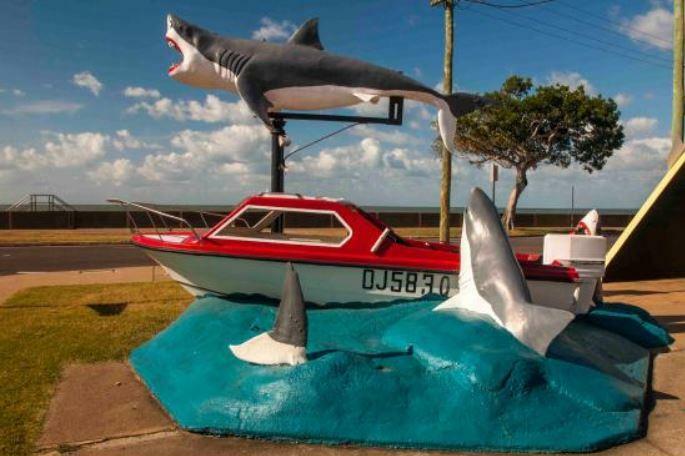 The boat and the sharks forming part of the Vic Hislop shark display formerly on the corner of Elizabeth St. and The Esplanade have now been safely relocated to the Historical Village & Museum in Zephyr St., Scarness where it will be restored to its former glory as a Bay Icon. The large shark which stood over the display is also available but for a price. We have been advised it will be in the region of $4000. This is beyond our means so we are looking for assistance to acquire this item. We are offering local businesses and also the Community the opportunity to be a part of this project and to help out by donating towards the purchase of this item. A plaque acknowledging donations over $100 will be erected along with the shark once acquired.